An injured Marine from Dandridge has a new home designed to help him move around despite his physical limitations. Homes for Our Troops builds specially adapted homes for severely injured veterans. Sgt. Bradley Walker is one of the latest recipients of their efforts and on Saturday he received the keys to his new home just in time for Christmas. Sgt. Walker lost both of his legs in Iraq, so the organization built him a new home created to be wheelchair accessible. 'We live in a great country, the greatest country in the world and we have freedom and independence to do what we want. It is our soldiers, sailors, airmen and Marines that protect those freedoms and independence for us," said Tim McHale, president of Homes for Our Troops. Sgt. Walker described the home as beautiful. "It's all so very surreal and words cannot express everything that I'm feeling right now," he said. 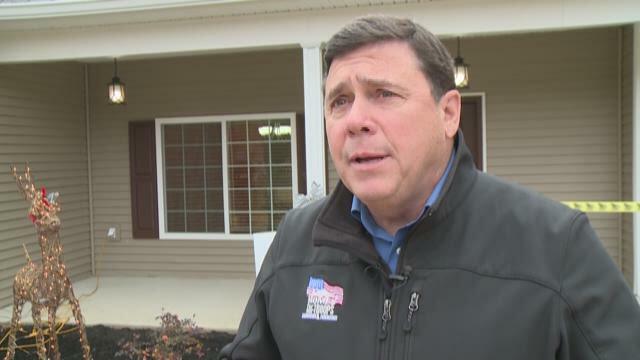 "This is not a charity giving away a home, but a moral obligation of our society to take care of those men and women who have sacrificed so much for our country," McHale said. Sgt. Walker says his heart is full of gratitude for the organization's generosity. "There's not enough ways I could say thank you for everything. This is all so amazing, just, words cannot express the enormity of all this and... it's just breathtaking really," he said. Sgt. Walker's new home includes more than 155 special adaptations to help make his life easier. Homes for Our Troops has provided homes to 178 wounded veterans.